I love looking at home decor pictures. A few of my favorite sites are Apartment Therapy, Ideal Home and Houzz. I would love to have an open plan kitchen. You feel more a part of what's going on around you and it's airy. I love this one. The blue is my favorite color. I believe Crayola coined it "cadet blue". Now bathrooms are a sanctuary. 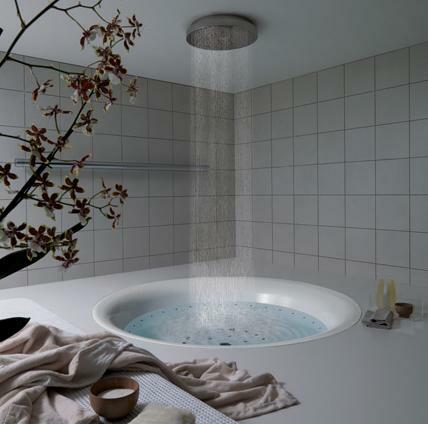 Imagine having a shower under this. Like a rain cloud over your head! 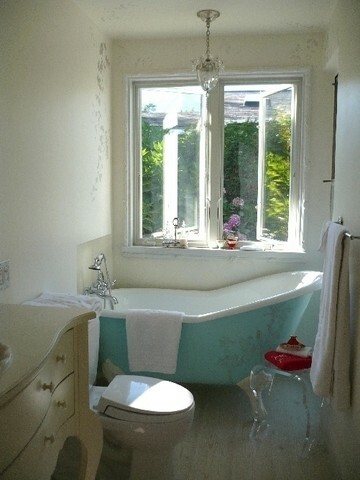 I don't need a huge bathroom, Just a big, claw foot tub. That's luxurious on it's own. Bedrooms should be serene. I love the grey striped wall and the throw pillows here. The storage bench is also handy and cute. I think I like this one more. Chocolate brown and pale pink. I also love the bedside lamps. The family room is the most important, I think. I love this one. It's cozy and clean and welcoming. I like the idea of a ottoman/coffee table. It has my favorite colors and plenty of seating. Click the photo to see the rest of this amazing room. I DO love that shower...and the tub, too. Beautiful. Umm Aaminah, InshaAllah I hope so too! Umm Omar, It's what I look at first, bathrooms. For some reason it's just a personal thing I guess, I love a nice bathroom. Shahirah Elaiza, A girl can dream! ohhhhh. I am SO tempted to email some of these pictures to my husband and ask him for the funds to redecorate our home. To which he'd probably reply, "Sure dear. But the funds come out of YOUR pocket". 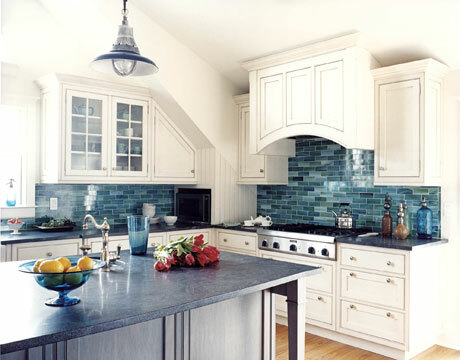 Love love LOVE the kitchen and the bathrooms.... sigh. Kit Pryde, LOL, if one has the funds I'm sure it's worth it.